Many of the people think that they should make their own unique blogger template but its not to easy nowadays i have seen many generators have came in place to make blogger templates but they dont stand out our needs we can make a blogger template by the Use of CSS and HTML . yes, before making any blogger template you must have basic knowledge of these both. and must know to make any HTML page. How to make DIV CLASSES ? 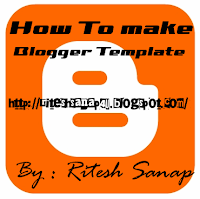 My Last Tip on this Topic Is that Try to Use more of the hack about blogger available on the Web to make it perfect one. Next Next post: How to send content summary only for my feedburner subscribers via email?